A fast drying paint for mounting samples, particularly for SEM and dispersive analysis. Does not tend to siphon up through porous specimens. Carbon results in a black background in back‐scattered mode. Carbon contaminants in the specimen chamber of analytical systems tend to be benign. The carbon/graphite mixture conducts well. Dilute with isopropanol alcohol. Store in refrigerator or freezer to slow thickening. Now in a plastic squeeze bottle with valve cap for easy application. Contains steel ball for efficient shaking before use. This is an easy‐to‐apply resistance coating designed to provide high lubricity, conductivity, and excellent release properties to many non‐conductive substrates, including most plastics. It is made from a dispersion of colloidal graphite in an isopropanol base which quickly air‐dries, forms an uniform thin film adherent layer. Air dries to touch in 5 minutes and is ready for use in 30 minutes. After air drying, bake for 5 minutes at 75°C to achieve optimum coating qualities in a shorter curing cycle. Flat surface texture. The average flake size is 1µm. This item is not a DG and shipping to overseas addresses is not a problem. Carbon flakes in an inorganic silicate solution for bonding resisting up to 2000°C. 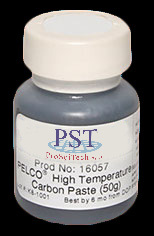 The High Temperature Carbon Paste is aimed for applications where a conductive cement is needed which withstand temperatures up to 2000°C.This paste is ideally suited for mounting specimens on hot stages for SEM , FESEM, XPS, ESCA, SIMS and AUGER systems. Also for applications where silver migration or a reaction with silver or nickel flakes could be a problem, this product would be an excellent alternative. Carbon content is 50-60% by weight in an inorganic silicate aqueous solution. Conductivity in cured state is 4.6 ohm/square/mil. Must be fully cured to achieve good conductivity and strong bond. Soluble in water to 260°C. Cure schedule is: air dry at room temperature for 2-4 hours, step cure at 93°C and final cure at 260°C. 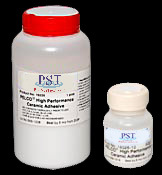 The excellent thermal and electrical conductivity, coupled with the absence of hydrocarbons, make this product ideal for demanding specimen preparation in FESEM, XPS, ESCA, SIMS, Auger and other applications. 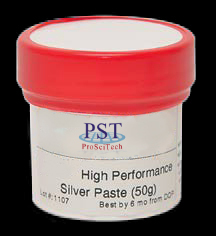 High performance silver paste provides both high and thermal conductivity, with a silver particle size of 20µm. Silver content >60% by weight. Cures at room temperature, but requires a 2 hour cure at 93°C to achieve high conductivity and strong bond. Must be fully cured before using this product at cryogenic temperatures. Soluble in water to 260°C. Above this temperature it becomes almost insoluble. Troubleshooting: If not conducting; stir thoroughly to mix the settled silver particles through the paste. Fast drying silver particle suspension with a very small average grain size of 1.4 to 3.6µm. Excellent conductor. Supplied in a plastic squeeze bottle with valve cap for easy application. Contains steel balls for efficient shaking before use. 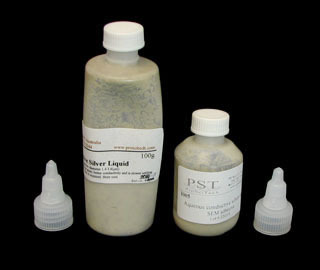 For large users the silver liquid is also available in a 100mL bottle. The small grain size results in better conductivity and settles more slowly. Appearance is less silvery on account of the refractive index. Similar to the above but based on an aqueous binder. This product is not a DG for shipping purposes. It is slower drying, but this can be rushed by oven or heat-lamp drying. Since this liquid is water-based, smells, flammability and too fast drying times are avoided; it's also a stronger binder. The good thermal and electrical conductivity of this adhesive, coupled with the absence of hydrocarbons, makes this product suitable for demanding specimen preparation in surface science and SEM applications. Nickel particle size is 20µm, nickel content is >60%. 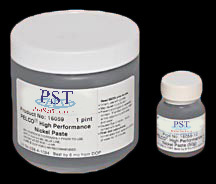 The High Performance Nickel Paste needs to be cured for 2 hours at 93°C to achieve final electrical and mechanical properties. It is soluble in water to 260°C, above this temperature it becomes almost insoluble. 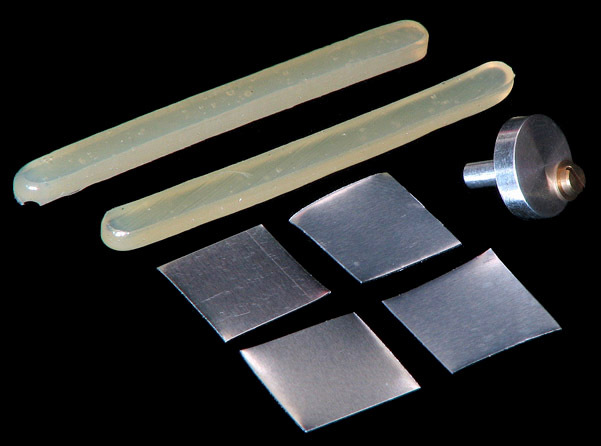 For nonconductive, high temperature adhesive try high performance ceramic adhesive. For more demanding applications, try high Performance Silver Paste. This pen is simple and efficient to use for adhering samples to SEM stubs. Designed to produce instant conductive silver traces, the specially formulated silver-bearing thermoplastic polymer dries in minutes at room temperature. Valved pen tip allows smooth flow with normal writing pressure and is spring-loaded to prevent clogging. 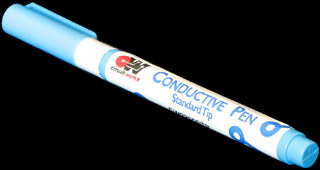 If you wish to use the pen for traces, solderable terminations are possible using a 120°C cure for 15-20 minutes. Tin, lead or silver solder can be used (do not exceed 180°C for more than 5 seconds). Each pen is able to make approximately 30 metres of traces. 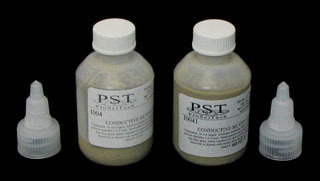 39-45% silver content; particle size is under 10µm diameter. Thinner is butyl acetate. 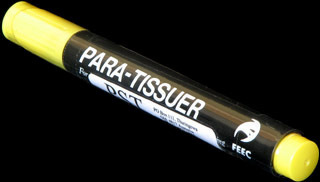 This pen provides a sticky membrane which not only stops paraffin sections from moving, wrinkling or falling off but also "flattens" the sections. This obviates the need for hot water treatment of the sections. The membrane is stable to 120°C. Having prepared the tissue specimen for immunolabelling, it is imperative to perform the incubations with a protocol designed to maximise the specific signal and minimise the background. Some incubation conditions may cause the tissue sections to be removed from the glass slide. Typical tissue section adhesives such as poly-L-lysine, Elmer's glue, chrome alum, etc... are not suitable for use with immunogold labelling, because of the increased background caused by the attraction of gold particles to the adhesive on the slide. Furthermore, the surface of glass slides is uneven, and it is activated by the silicon tetrahedral structure. It provides active sites for absorption of proteins or reactions with chemicals and reagents. Therefore it is important to minimise this possibility by coating the surface with a material which is of low reactivity towards reagents. Biobond produces a very strong adhesion between the glass slide and the tissue section for subsequent incubations, as well as a protective layer to minimise the interaction between the charged glass surface and the reagents. Biobond is suitable for all kinds of tissue specimens including, but not limited to, paraffin wax, resin sections, cell smears, cytospins and cryostat sections. Biobond is supplied in a 20mL vial, which is sufficient to coat at least 1000 slides. This item is virtually identical to Tempfix (I668), except that Leit-C-Plast is carbon loaded and conducts without a conductive coating. A thermoplastic adhesive for mounting powder specimens and small particles especially for SEM. It does not contain any solvents and it is stable in high vacuum. It is not sticky at room temperature but becomes adhesive at 40°C and melts at 120°C. Tempfix may also be used as an embedding medium. The kit contains two gluesticks, a pin-type mount with a lock-screw and several pieces of aluminium shim. The glue is applied to Al shim pieces on a hotplate at 120°C. These coated pieces may be stored for future use. Sprinkle particular specimens onto coating of Al shim and heat briefly on hotplate to 40°C. Tap or blow off any lose particles and then coat specimen. The shim may be examined after fastening to the supplied pin-type mount with set-screw. 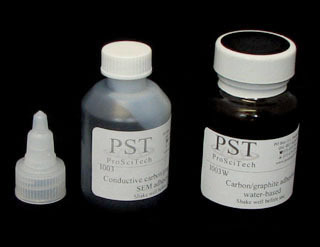 Liquid-repellent slide marker pens for staining procedures; 5mm pen nip assures broad band to retain fluids. 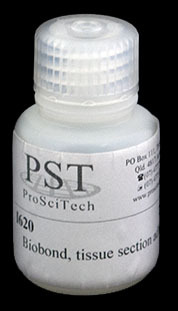 The liquid blocker pen is very resistant to PBS, TBS, and TBST in immuno-staining procedure. Circle can be removed with xylene. What a difference a pen makes: We found a cheaper PAP pen and some people love it; others politely declare it to be a waste of money. Perhaps it depends on the application or how the pen is held. We offer both types, the choice is yours. A hydrophobic barrier pen for immunohistochemistry and in situ hybridisation. The ImmEdge™ Pen, a hydrophobic barrier pen for immunohistochemistry and in situ hybridisation detection methods, is designed for use with frozen or paraffin-embedded tissue sections mounted on glass slides. The ImmEdge™ pen provides a water repellent barrier that keeps staining reagents localised on the tissue sections, prevents mixing of reagents when differentially staining two sections on the same slide and allows the use of less reagents per section. The boundary deposited by the ImmEdge™ pen is lightly coloured and easily visible. It is insoluble in alcohol and acetone, but is removed by most clearing agents. The ImmEdge™ pen is compatible with all commonly used enzyme or fluorescent-based detection systems. Especially designed to withstand alcohol, xylene and other solvents used in histology work and labels may be wiped off with water. These markers are perfect for marking cassettes and microscope slides. For initial use prime by applying gentle pressure to the tip. Tips have a fine point and these are replaceable. Black pen marks are visible in backscattered SEM mode, this makes markers suitable for microanalysis. 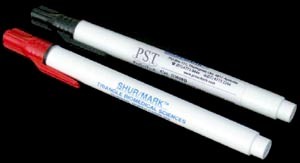 The STATMARK™ Pen is the ideal black marker for histology and cytology labs. The permanent ink resists even the harshest chemicals, including formalin, ethanol, isopropanol and xylene. The writing remains clean, clear and legible throughout the range of laboratory procedures, including processing and staining. The ink dries quickly and will not run or smear. It lasts through fixatives, baths, dips, stains, bleaches and more. Premium slide/cassette marker. Resistant to all solvents. Writes smooth, dark and fine on all cassettes and all slides. Use for cytology as a " dotting" reference marker as well. Note: Rubbing may remove ink from glass when wet with some solvents. Securline brand felt-tip marking pens are perfect for labelling glass. They contain a permanent, fast-drying ink that withstands most solvents and autoclaving, remaining waterproof and smudge-proof. Pen with pocket clip is 133mm long. The high performance ceramic adhesive has been especially developed for bonding and sealing ceramics, metals, quartz and glass for high vacuum, high temperature and cryo applications. It is a dispersion of alumina in an inorganic silicate aqueous solution. Comes in the form of a paste and can be easily applied with a brush or a spatula. Good mechanical strength is achieved within minutes at room temperature. Curing schedule is 2 hours at 93°C. Full properties are reached after curing. It provides both low electrical and thermal conductivity. Sold in 2 sizes: a container holding 473mL (ask) or a container holding 50 grams (approx. 22mL). For conductive applications consider high performance silver paste.